Indoor air quality is an issue that concerns many of our customers in the Windsor, Ontario region. While everyone would like their home to have clean, safe air, the reality is many indoor contaminants are making us sick. The good news is that preventing indoor air quality problems is fairly easy and economical. At Harris Heating & Air Conditioning we want you and your family to have the best indoor air quality Windsor and Essex County have to offer. That’s why we insist on products that exchange the stale and polluted air within your home with fresh, clean air from outside. A few of the products we install that can greatly improve your home’s air quality include; filtration systems, HRV’s (heat recovery ventilator’s), HEPA filtration systems, humidifiers, dehumidifiers, and UV lights. Call today to learn how we can help find a cost effective way to make the air in your home cleaner and healthier in which to live. Other indoor air quality pollutants can include oil, gas, paint, kerosene, coal, wood, and tobacco products. Mould, radon, pesticides, and cigarette smoking are also well known contributors to indoor air quality pollution. 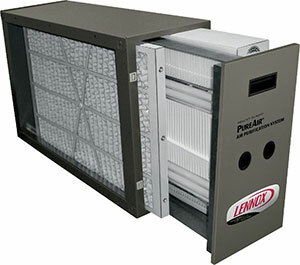 The Lennox Pure Air™ system protects your indoor air from all three types of indoor pollutants – airborne particles, germs and bacteria, and chemical vapors. PureAir™ is a whole-home solution that addresses pollutants that can circulate throughout your entire home filtering out as much as 95% of particles down to .3 microns. Please visit Health Canada for additional information on indoor air quality issues. Service area – Includes Windsor and Essex County (LaSalle, Leamington, Kingsville, Amherstburg, Essex, Tecumseh, and Belle River). If you are outside of our service area please call us and we will do our best to help.